What is Account Picture ??? 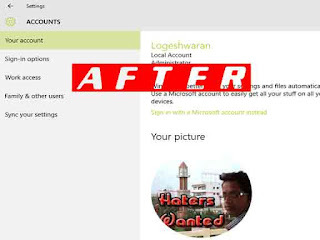 How Can i Delete the Account Picture ?? Upcoming Steps in your Windows 10 PC. Step 2 : When You Logged in Open My Computer. Step 3 : Type the Below Address in Your Address Bar. ThisPC->the Drive You installed Windows ->Users->(User Name)->AppData->Roaming->Microsoft->Windows->AccountPictures. Step 4 : Delete the Picture You Need to Clear. Step 5 : Close the Windows. That's All You Have Successfully Deleted your Recent Account Picture.